Freshman Year, as a graduation party organizer!!! 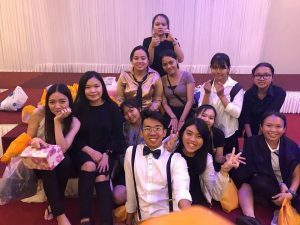 This is the fourth blog-post from Esther Tot who received the ESOMAR Foundation Scholarship to study at the English based Bachelor Degree program in International Business at the National University of Management (NUM) in Phnom Penh, Cambodia. Wohooo!!!!!! It’s the end of marketing class! Loads of assignments and self-discipline are over. 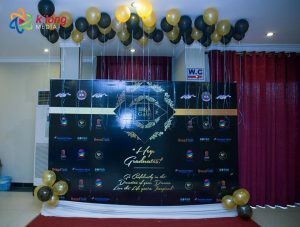 At the same time there is also a year4 graduation party so our last and final assignment of the marketing class was to organize a party which is for all IBBA-er and especially for year4 students who are likely to graduate at the end of this year. 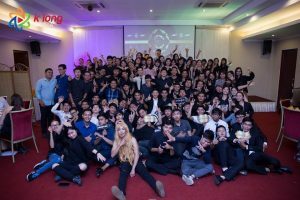 As an IBBA year1 or freshman year or as my marketing lecturer likes to call us the “baby prawn”, because we are the youngest among all the other classes at university, on August 12th, 2017 all year1 held the task of organising one big event as we called it “IBBA Gala”. We divided into teams: the morning team planned and organized the activities of the event and we, the afternoon class, were tasked with contacting and finding sponsors for our event and we finally did a very good job! Our lecturer was proud of us as year1 students. The activities and program had some fun features: female students in year1 had to dress like a man and male students had to dress as a girls and there were also some fashion shows as guy dressed as girl and girls dress as guy, as well as singing, and teachers and student awards. I am at the back!!! With the L hand style! 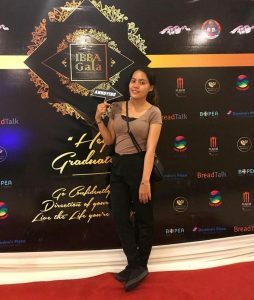 As for me being in year1 and holding this kind of big event is something I will be proud of myself for the next few years because it is a real learning experience and I felt I was in a real world as a business woman and marketer. I have successfully contacted the sponsor from Hot&Cold Café and my class successfully contacted BreadTalk, Major Cineplex, BOPEA, CAM Paint, and Domino’s Pizza (you can see the company’s logo on our backdrop). This was the hardest year because it was my first year at university and next year I believe it will be better than this because I will learn to adapt to the university life from this year experience.